Smith-Lemli-Opitz syndrome (SLOS) is a multiple congenital anomaly (MCA)/intellectual disability (ID) syndrome caused by a defect in cholesterol synthesis. Smith-Lemli-Opitz syndrome is an autosomal recessive genetic condition caused by a deficiency of the enzyme 3 beta-hydroxysterol-delta 7-reductase (7-dehydrocholesterol-delta 7-reductase [DHCR7] EC 1.3.1.21), the final enzyme in the sterol synthetic pathway that converts 7-dehydrocholesterol (7DHC) to cholesterol. Affected individuals usually have low plasma cholesterol levels and invariably have elevated levels of cholesterol precursors, including 7DHC. The most severely affected individuals (those with the condition formerly referred to as Smith-Lemli-Opitz syndrome type II) have multiple congenital malformations and are often miscarried or stillborn or die in the first weeks of life. 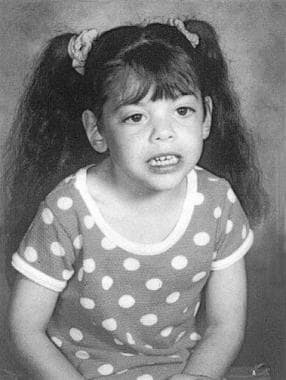 Dysmorphic facial features, microcephaly, second-toe and third-toe syndactyly, other malformations, and mental retardation (MR) are typical. Mildly affected individuals may have only subtle dysmorphic features and learning and behavioral disabilities. The classic paradigm for the pathogenesis of an inborn error of metabolism includes the accumulation of a toxic precursor and/or deficiency of an essential product as a result of an enzyme deficiency. In the case of Smith-Lemli-Opitz syndrome, the precursor 7DHC is potentially toxic in large concentrations, and cholesterol deficiency is almost certainly detrimental. Smith, Lemli, and Opitz initially described Smith-Lemli-Opitz syndrome as a genetic MCA/MR syndrome in 1964. They named the condition RSH after the first initial of the last names of the first 3 patients ascertained. The clinical characteristics of Smith-Lemli-Opitz syndrome have been well established over the past 4 decades. The etiology of Smith-Lemli-Opitz syndrome was unknown until 1993, when Irons et al discovered that patients with Smith-Lemli-Opitz syndrome had low plasma cholesterol levels and accumulated sterol precursors such as 7DHC. A deficiency of the microsomal enzyme DHCR7, which reduces the 7-8 double bond of 7DHC to form cholesterol in the final step of the cholesterol synthetic pathway, was hypothesized and later proven to cause Smith-Lemli-Opitz syndrome. Mutations in the DHCR7 gene are responsible for Smith-Lemli-Opitz syndrome. Therefore, Smith-Lemli-Opitz syndrome can now be considered a classic inborn error of metabolism. Currently, the reason defects in cholesterol synthesis cause congenital malformations is not known. Several disparate lines of research have led to recent understanding of the critical and somewhat unexpected role of cholesterol in early human development. Cholesterol is important in cell membranes, serves as the precursor for steroid hormones and bile acids, and is a major component in myelin. Cholesterol is covalently bound to the embryonic signaling protein sonic hedgehog (Shh) in a necessary step of the autoprocessing of the precursor to active form, occurring about age gestational day 0-7 in humans. Shh plays a critical role in several embryologic fields relevant to Smith-Lemli-Opitz syndrome (eg, brain, face, heart, limbs). Therefore, cholesterol is an essential triggering agent in the early developmental program of the human. Because 7DHC can also activate Shh, cholesterol deficiency that leads to decreased activation of Shh is probably not the sole explanation for congenital malformations in this syndrome. Abnormalities in the Shh-patched signaling cascade presumably play a role. Membrane instability and dysmyelination from cholesterol deficiency and accumulation of 7DHC and other potentially toxic cholesterol precursors are also likely to contribute to the Smith-Lemli-Opitz syndrome phenotype. Prevalence of Smith-Lemli-Opitz syndrome has been estimated to be 1 in 20,000-60,000 births among whites. Smith-Lemli-Opitz syndrome is also not uncommon in Hispanics. Its specific prevalence in different populations has not been precisely determined. The higher-than-expected prevalence of Smith-Lemli-Opitz syndrome suggests a heterozygote advantage. The results of Wright et al's 2003 study indicate an IVS8-1G>C carrier frequency of 0.73% (10 per 1378 population) in African Americans. This predicts the prevalence of Smith-Lemli-Opitz syndrome due to IVS8-1G>C homozygosity to be 1 case per 75,061 persons in the African American population. Although the African American carrier frequency of the IVS8-1G>C allele was determined to be 0.73%, few African American patients with Smith-Lemli-Opitz syndrome have been identified. Carrier frequency for Smith-Lemli-Opitz syndrome is approximately 1 in 30 persons of northern European descent, suggesting a disease frequency of 1 per 5000-18,000 people. The actual disease prevalence may be lower because of fetal losses. Death from multiorgan system failure during the first weeks of life is typical in the most severely affected individuals with Smith-Lemli-Opitz syndrome. Cause of death can include pneumonia, lethal congenital heart defect, or hepatic failure. Survival is unlikely if the plasma cholesterol level is less than approximately 20 mg/dL as measured by gas chromatography, which is used because routine methods of cholesterol measurement include precursor sterols. Congenital heart disease is not uncommon in Smith-Lemli-Opitz syndrome and can cause cyanosis or congestive heart failure. Pulmonary hypertension has been noted in at least one patient. Vomiting, feeding difficulties, constipation, toxic megacolon, electrolyte disturbances, and failure to thrive are common and, in some cases, related to GI anomalies. Liver disease has been commonly described. Visual loss may occur because of cataracts, optic nerve abnormalities, or other ophthalmologic problems,  and subclinical retinal abnormalities may be noted on electroretinography. Cataracts may occur acutely in the postnatal period. Hearing loss is fairly common. As an autosomal recessive genetic condition, Smith-Lemli-Opitz syndrome is equally prevalent among males and females. Smith-Lemli-Opitz syndrome is a genetic condition that is present from conception, but signs may occasionally be so subtle that patients avoid detection until later childhood or even adulthood. Some have postulated that the mildest cases may completely escape detection in some instances. More commonly, Smith-Lemli-Opitz syndrome is suspected at birth or shortly thereafter because of birth defects.